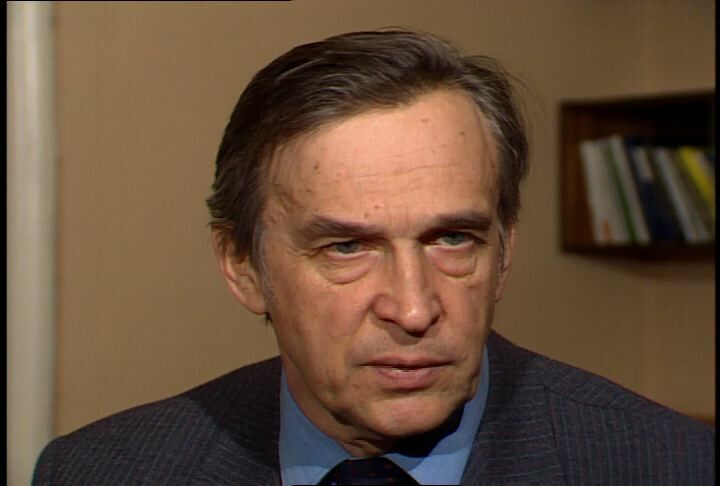 Valentin Falin was an influential career Soviet diplomat, and later journalist, who specialized in European and particularly German affairs for most of the Cold War. In this interview he details the German problem, during which, he alleges, the U.S. pushed for imposing decisions on the Germans and recreating the German military for its own objectives. He provides personal recollections on German rearmament, including the deep concerns generated by what he describes as American plans to use ex-Nazis to rebuild the country's military capabilities. By contrast, he asserts, the USSR initially hoped only for the creation of a neutral and friendly German state along with other unaligned states in the region. The Marshall Plan, he declares, was primarily a means of forcing Europe to toe the American political line. He describes a "complex" Soviet reaction to the formation of NATO and the decision later to create the Warsaw Pact, challenging Western portrayals of the threat posed by Soviet forces after the war. He also offers a description of nuclear developments in the late 1940s, including his views on the formation of British and French atomic forces. The Suez and Berlin crises are also discussed from the point of view of Soviet thinking, as is the 1961 Vienna summit. On nuclear issues, Mr. Falin provides Moscow's conceptions of the Cuban missile crisis and of America's massive retaliation and flexible response strategies. He also reviews the Sino-Soviet split and the Korean war, including the threat of nuclear deployments during that period. He closes with a description of the Czechoslovak coup of 1948. Chicago: “War and Peace in the Nuclear Age; Europe Goes Nuclear; Interview with Valentin Falin, 1986 ,” 12/09/1986, WGBH Media Library & Archives, accessed April 20, 2019, http://openvault.wgbh.org/catalog/V_1008082DBA5E43558D585CE8795C35FD. MLA: “War and Peace in the Nuclear Age; Europe Goes Nuclear; Interview with Valentin Falin, 1986 .” 12/09/1986. WGBH Media Library & Archives. Web. April 20, 2019. <http://openvault.wgbh.org/catalog/V_1008082DBA5E43558D585CE8795C35FD>.